Now presenting our second major character of three. Yesterday we posted up 'X' and today shall be 'Warden'. The significant difference between our first character reveal and onward is that 'X' was the only character without 'Powers' or people with superhuman-like abilities. Which is basically what our entire premise and storyline are based off of so it gets pretty interesting. See Dario Rickman aka 'Warden' after the jump. 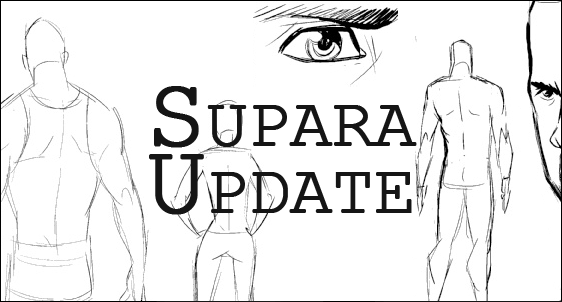 We like how the on-the-fly format we ran with Supara Update #4's post turned out, so we're going to stick with that for consistency's sake. All artwork is courtesy of the talented Michael Mayne which you can find/follow him on devaintART, Blogspot, & Twitter. Detective in the Power Related Criminal Unit at Wesvale Holding. I wanted Dario to have a sense of grit to him. Looks like a hard worker, is quite the badass, while being fun. We slightly based him off of the actor Djimon Hounsou. The facial hair was something of a must to lend some originality along with his name. Dario is something you hear too often in the states but with his abilities and prowess, I think it's a perfect match. Super Strength - Able to lift nearly 3 tons before feeling a lot of pressure. This also enables him to leap far and take a bit more damage than a typical human being. 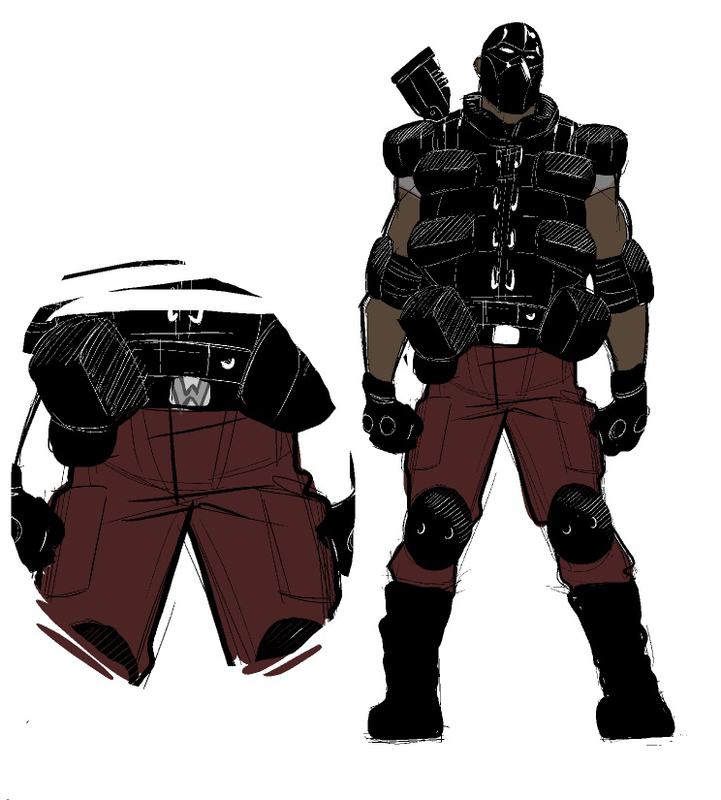 Herculean - Given his incredible strength and willpower, he can easily manhandle almost any opponent in barehanded combat using standard wrestling and police take-down tactics. 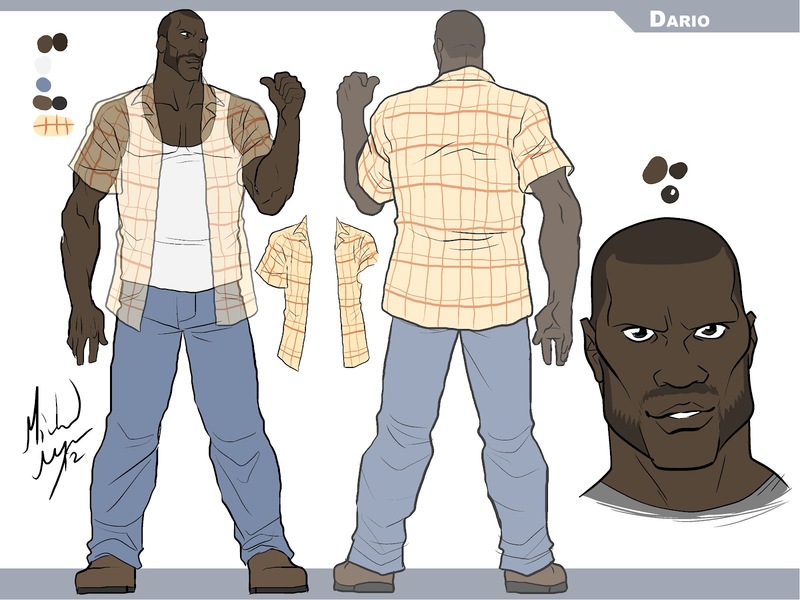 Third Arm - Even though Dario can wrestle a giant with ease, he does occasionally wield a modified shotgun that can fire various forms of non-lethal ammo such as shock pellets, smoke bombs, grapplers, nets, etc. The list can go on. As you can tell for a man with incredible feats of power, why is he nearly wearing full body armor with a very Army-of-Two-style mask? Because in our universe, a bullet can and will kill you. 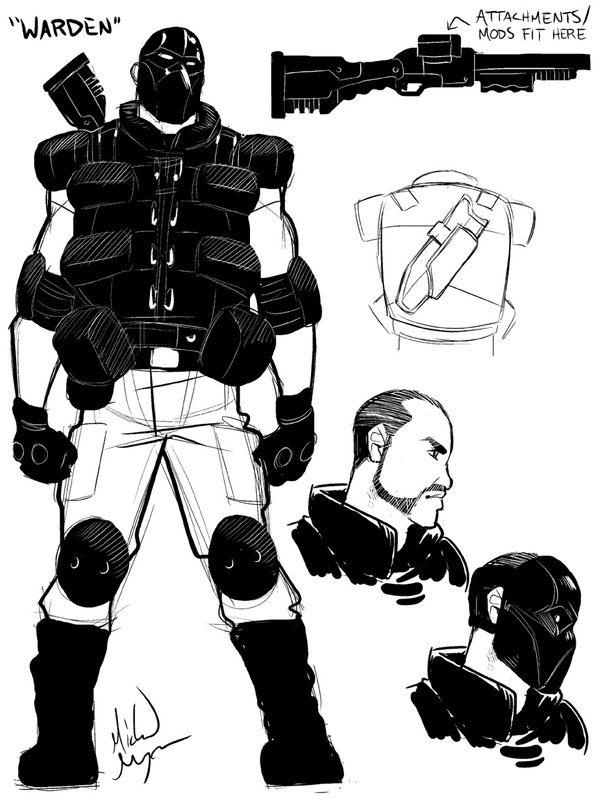 With the villains Warden is going to be up against; his attire is going to be more useful than not. Also, he's man from the police force, trained in gear similar to this... take what you know and apply it. Plus, this guy would terrify me. Dario Rickman is a quietly celebrated individual. Top of his class in Hudson and believes in the principles of justice. His only secret, from everyone including his family, is that he's a 'Power'. Too terrified to get sucked into the spotlight at a young age, he chose to keep it hidden away. He grew up in a world where 'Powers' were mysteriously dangerous. The guilt of his secrecy led him to become a police office hoping to bring a non-biased view to the force. Now second in command of a task force called the "Power Related Criminal Unit' dealing with homicides, robberies, petty theft… regardless of the case… if it has to do with a power; their division gets involved. Now a workaholic husband of Sharleen and father of two; Vanessa (5) & Valarie (8), Dario's living the life he's always dreamed of... until the events of downtown Supara. This is what led him to try to make a difference beyond the blue uniform, this is what led him to work outside the law, and this is what led him to partner with the criminal known as 'Sync'. Since Michael (artist) decided to nail the look for Warden pretty much on the nose, I asked him to add a little bit of detail to his jacket with some clasps, color in the pants with a darker red, and add an iron plated "W" to his belt bucket. 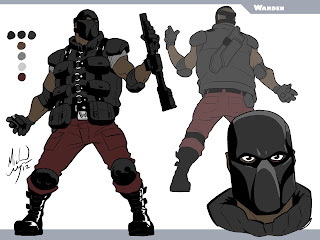 The more I thought of Warden, he reminds me a lot of a non-lethal version of The Punisher. 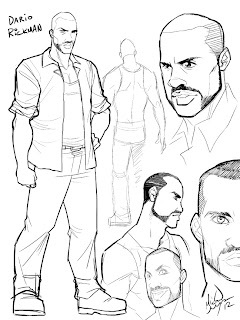 Being a highly respected detective working in an under-budgeted department doesn't affect Dario’s outlook on life. That is until the events of Supara. He'll have to deal with running three full time lives as an officer, a masked revenger, and a family man. Stretching himself this thin will ultimately change his life with his family and career. His demeanor will change into something of a jaded veteran lost in the woods. Dario is a tough guy, in this final civilian attire... you can clearly see he means business. What's difficult sometimes is creating something that looks different while trying to maintain a sense of reality. I know it may seem like a troupe with the white guy (Nico) spiffed up and Dario looks manly yet relaxed but that's honestly how they're characters came to fruition. One is a doctor, the other's a detective. This guy actually looks like a detective from the LA area. Perfect in my view. This is your Jim Gordon and Batman in one. Except this time… Jim works within a special unit meant to police a certain group of people (Powers), while continuously fighting corruption from the inside out. Teaming up with “Sync”, weighs heavy on him and he basically questions his every move. He’ll struggle with the fact that all the things he’s doing is also considered corruption and in most cases… terrorism. The term justice will constantly be re-evaluated and maybe... re-purposed. Here is the final piece for Warden's outfit. Much like the revision but the detail is spot on. I feel the most appealing part about this attire is that it's very practical. Mainstream superheroes tend to have these perfect excuses to not wear something as bulky or overdressed as this but it can work in some cases. This being one of them for sure. Whoa... so much writing. Well I'm not done by a LONG shot. 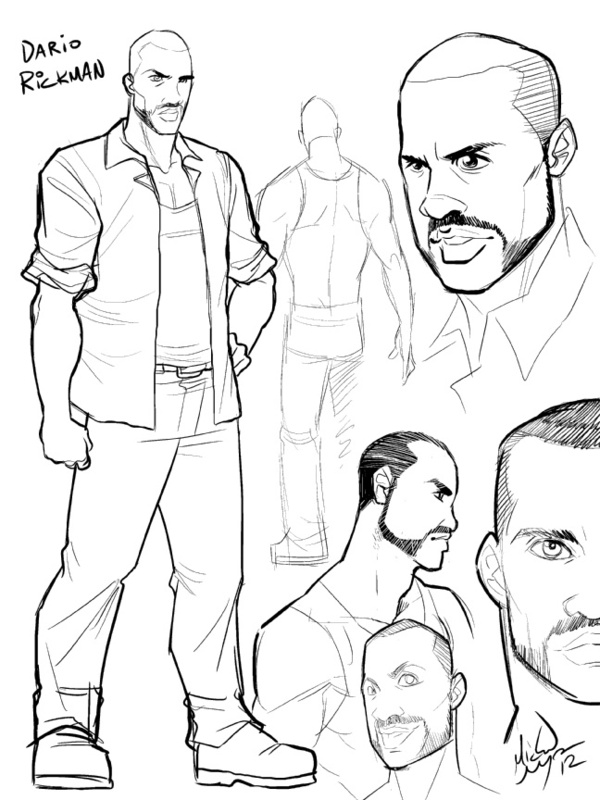 Check back again tomorrow for the first look at our final character (for now) "Dakota Gretchen 'Starstuck"'. You can also check out more of Michael Mayne's work over at devaintART.